If we owned our home, rather than renting it, there are definitely a few changes I’d want to make. High up on the priority list would definitely be a black and white bathroom renovation for our master suite. Of course, I already have an idea of what I’d do! A monochrome palette would work well with our master bedroom, but adding brass and wood accents would warm the scheme up and keep it feeling cosy. 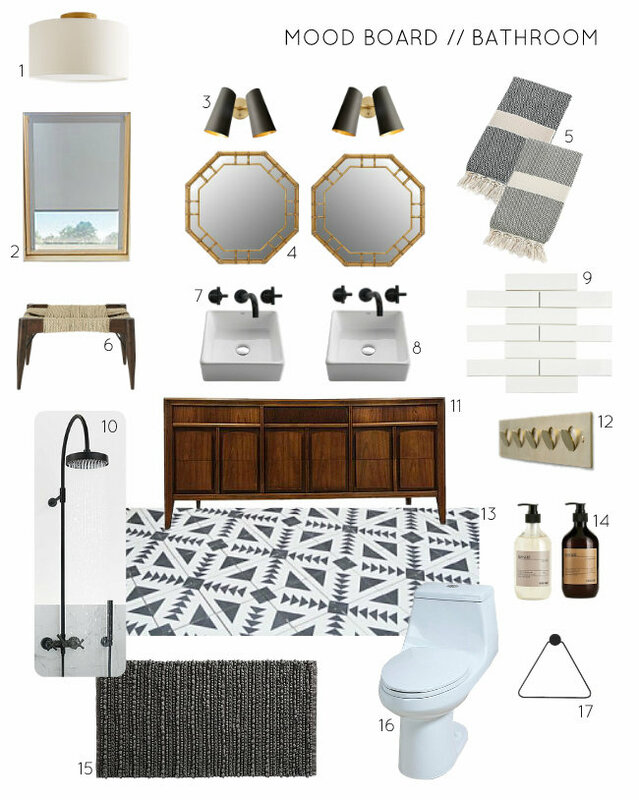 This is a look that I’ve pinned variations of on my Bathrooms pin board a lot – I just love this combo. As the bathroom stands now, the only thing that would stay are the Velux blinds, which are minimal and about as functional as you can get. Everything else is a dated combo of beige fittings and tile with a cheap laminate countertop, so I’d gut the whole thing and start again. The only thing in this mood board that wouldn’t work for our home is that we wouldn’t have space for a double vanity, but a smaller vintage chest with a single sink and mirror would work well too. I love the pairing of vintage pieces with modern fixtures – I think it makes a space feel layered and more considered than it would if you stuck to just one or the other. This post was sponsored by Roof Blinds, suppliers of Velux blinds, and contains some affiliate links. All opinions and daydreams are my own, as always. I only share things I love, and hope you will too. Love this design Lizzie!! I would do the same for my own. If I had the money hahaha. Always money!